We, literally, stumbled upon Vini e Vecchi Sapori while heading for the Palazzo Vecchio and Piazza della Signoria, the busiest and most famous square in Florence. The streets in Florence are made of large stones, not so evenly laid and sometimes causing tourists to stumble. I had heard of this restaurant through word of mouth and reviews on Yelp, but was not sure where it was. 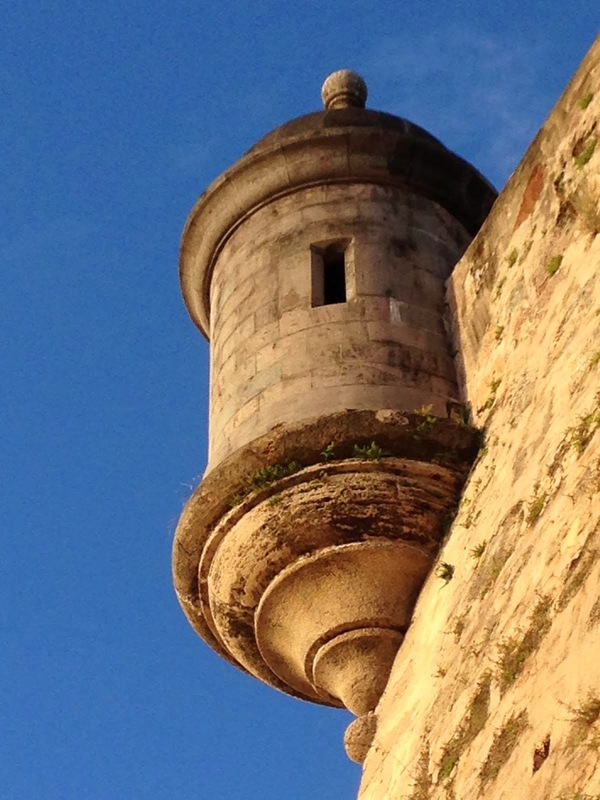 We almost missed it if not for my clumsy feet, hurling me toward the menu outside the door. 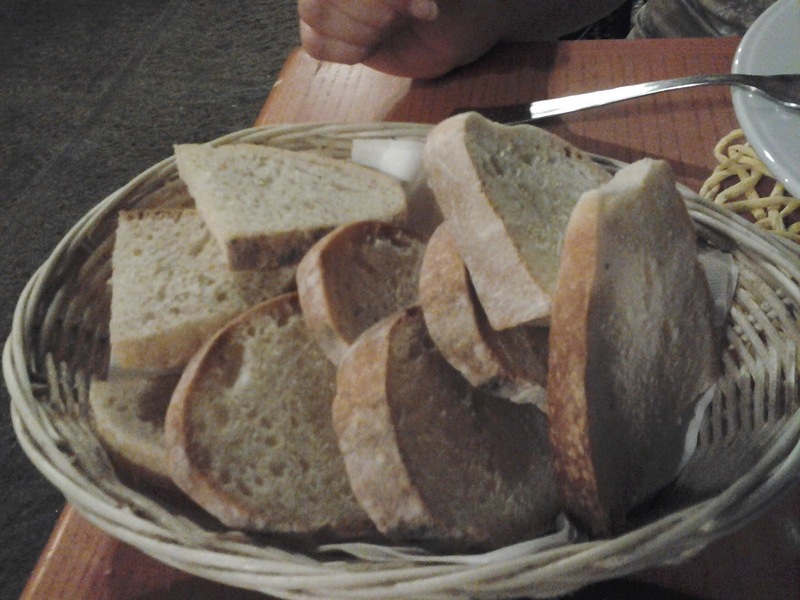 The menu says, in English, “NO PIZZA NO STEAK NO ICE” and consisted of five to seven each of the antipasti (appetizers), primi (first courses), and secondi (second courses) followed by a few contorni (side dishes) and dolce (desserts). The menu changes each day depending on what the chef feels like cooking and the fresh ingredients available. The choices on our first visit were enticing, so we asked if we could get a reservation that night…WRONG! When Saturday rolled around, we arrived at the appointed hour and Thomaso greeted me at the door…Signor Sorrentino, welcome! Impressed that he remembered my name after only one encounter, the festivities began. 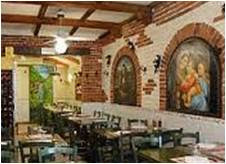 The restaurant is very small in a very old building with tall (18 foot) ceilings and tile floors. Beside the five or six tables, there is only a glass refrigerator case, like you would see in a deli, a small counter, and the door to the bathroom and to the kitchen (different doors). The walls are smothered, but tastefully so, with an eclectic variety of original art and prints, making the small room, I mean restaurant, warm and inviting. The restaurant sits on a short, narrow, quiet street just north of the Piazza della Signoria and has five tables or so, holding about 20 people. It reminds me of my favorite Italian restaurant in Los Angeles, Palermo, run by my old friend Tony, an immigrant from Palermo, Sicily and a warm, wonderful person. When Palermo opened back in the late 1970’s, it was just as small and quaint. Now Palermo is huge and packed every night of the week, a few blocks west of its old location. I hope that the same does not happen to Vini e Vecchi Sapori for it will lose much of its charm. 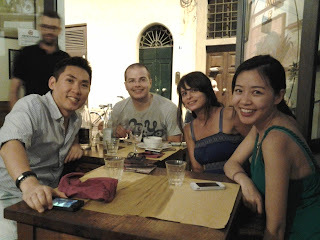 Thomaso sat us, then sat with us to explain the night’s menu. My wife’s dear friend Maddalena was with us and we were celebrating her birthday. We had visited Pistoia and Lucca by train that day, and had eaten foccacia con mozzarrella, prosciutto cotto, e carciofi (thin, herb covered bread with mozzarella, cooked ham, and artichoke inside) in Lucca that was larger than expected, so we decided to skip the antipasti and save room for the wonderful selection of primi and secondi. 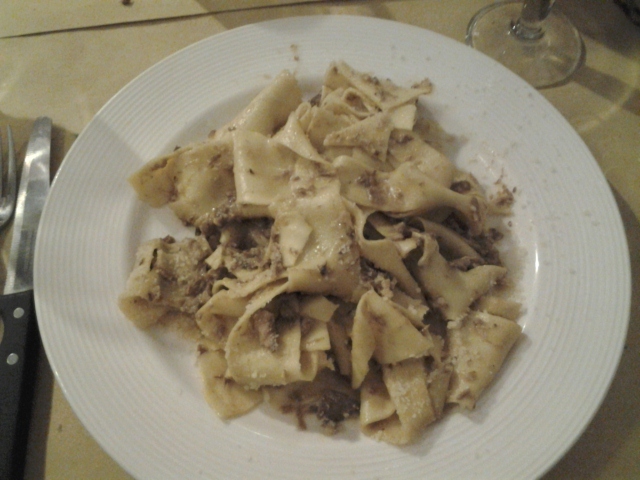 We started with the pappardelle con ragu di anatra (pappardelle are very wide fettucini-type pasta and they were covered in a rich minced duck sauce - €9) and paccheri con fiori di zucca e zafferano (yellow zucchini flowers and saffron - €8). The papparedelle con ragu di anatra was out of this world, just enough to satiate the palate for the time being, but never to be forgotten. 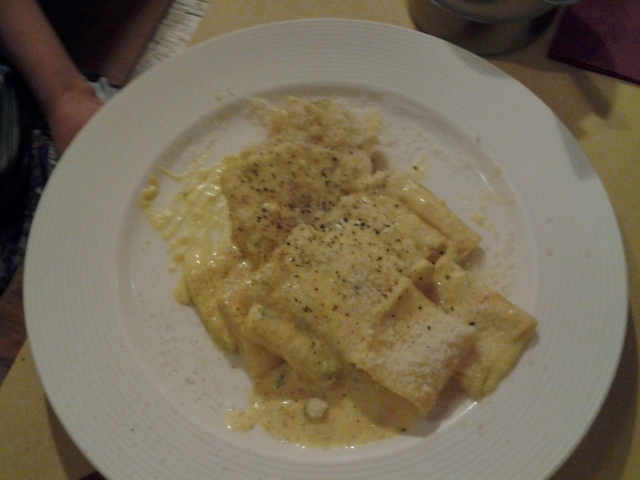 The paccheri con fiori di zucca e zafferano was delightfully done in a rich, creamy sauce and the pasta was thick and al dente, just firm enough to hold all of the wonderful sauce. I had never had saffron, a spice used mostly in the Middle East, in an Italian pasta sauce before, but it was creamy and dreamy. I hinted to Thomaso about obtaining the recipe, but will wait until we establish ourselves as regulars to make such a proposition. Having trouble deciding whether to have the scaloppine alla pizzaiola (similar to veal parmigiana, but much better - €14) or the ossobuco con piselli (veal shank - slow cooked with peas), Thomaso decided for me, it was the ossobuco (€14) and I was not disappointed! The veal shank was cooked to perfection, not huge by American standards, and falling off the bone with a hint of marsala wine sauce. It was delicious, the best ossobuco I have eaten and I have had a few. 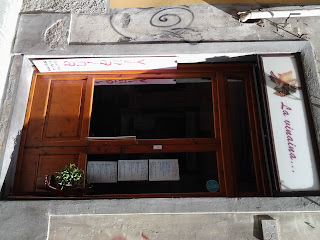 My wife had the torta ai carciofi (artichoke omelette - €8), but she wolfed it down while I was talking to the couple from Shang Hai at the table next to us, so I did not have the opportunity to get a taste. 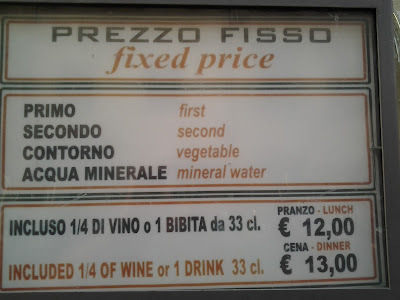 Our meal was accompanied by a litre of sparkling water (€2) and a litre of Chianti wine (€14), which was dark, rich, and flavorful with hints of berry and chocolate. Being so small, you easily fall into conversation with the table next to you. The first diners were a couple from San Francisco, she a teacher on break, and very nice, he a silicon valley marketing executive, seemingly very impressed with himself and eager to end the conversation. The next couple was from Shang Hai and it turns out that his family was from Glendale, California where I spent much of my childhood and college years, moving to Hacienda Heights after his graduation, where I had spent all of my school years. What a small world! Emma is Chinese, a native of Shanh Hai, and extremely engaging and sweet. The couple on their other side, I thought were from Holland by the accent, turned out to be from Jordon and were equally as warm and engaging. It was one of the most delightful dinners I have experienced in a long time. Finally, the dessert was ordered, while I was talking to Emma about her soon to be baby (due on Christmas day), so I did not have a choice in the matter. We tasted the tiramisu (€5), which was light and refreshing and minus the coffee, which by this time in the evening would probably have kept us awake all night, and the meringato (“big meringue” with cream and chocolate - €5), which was good, but not outstanding. 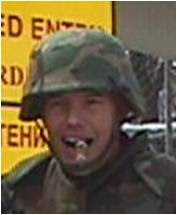 HOOAH ... It's the "BOMB"! Vini e Vecchi Sapori gets 9 BOMBS OUT OF 10 (“bombs” are good) from CombatCritic…my highest rating yet! A hidden gem! At €13 for a 3 course, excellent dinner (€12 for lunch), wine and water included, Trattoria da Giorgio is a terrific BARGAIN! Diners select from a primo (first course, usually pasta or soup), second (secondo...that wasn't so hard! 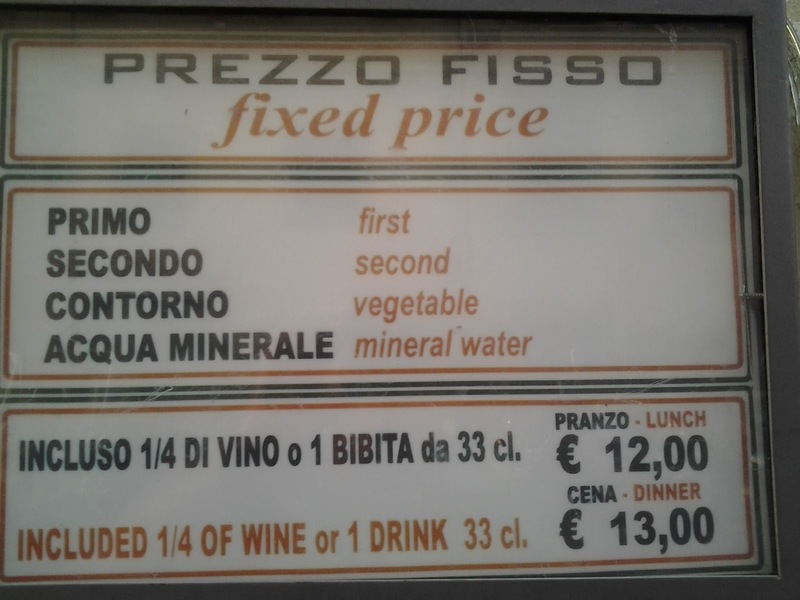 - usually a meat dish, but not necessarily), contorno (side dish - vegetables, salad, french fries - accompany the secondo), 1/4 litre of wine or a can of Italian beer, and 1/3 litre of water...ALL INCLUDED IN THE PRICE...NO TAX...SERVICE INCLUDED (although you should always leave a little something extra if the service was good). Pasta and risotto dishes are moderate in size, just large enough to allow room for your secondo and maybe a little dessert. The ravioli with butter & salvia (sage, not something to smoke) was perfectly cooker light with a hint of sage and the ravioli slightly al dente as they should be. The bigoli tartufo nero (thick spaghetti with black truffle cream sauce) were also excellent, thick and rich as you would expect from a truffle sauce. The risotto (rice) with asparagus and radicchio (not, radish, but a red cabbage-type vegetable) was of a perfect consistency and delicious while not overwhelming. The farfalle (butterfly) pasta bolognese (creamy meat sauce originating in Bologna...where else) with peas and mushrooms was outrageous and the pasta, again, cooked to perfection. On our first visit, my wife and I both had the scallopini al tartufo (pork tenderloin in a cream and black truffle sauce) and it was WONDERFUL! The pork tenderloins were medium in thickness and the sauce rich and creamy, softening the somewhat stale bread as I sopped-up what was left on my plate...not much! On our second visit, my wife had the prosciutto e melone (thinly sliced, cured (not cooked) ham, usually from Parma and white melon, similar to a cantaloupe in size and consistency, but not quite as sweet). The prosciutto was a bit dry, but delicious and the melon perfectly ripe. I, on the other hand, could not make up my mind between the insalata caprese (sliced tomatoes and mozzarella di buffala with freach basil and drizzled with extra virgin olive oil) or the scallopine marsala (thin veal medallions covered in a rich marsala wine reduction with walnuts). I love caprese and it rarely varies much in Italy, so I went for the scallopine...I was not disappointed! 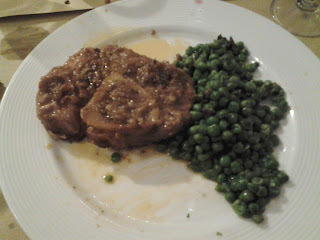 The veal was thin and tender as it should be and the marsala sauce was the best I have had in an Italian restaurant, and I have ordered it in many restaurants all over Italy, thick and rich....YUM! The tiramisu, €3, was icing on the cake on our first visit, an excellent mixture of mascarpone cheese, savoiardi cookies, coffee, cocoa, sugar, egg, amaretto...and two spoons of course! We tried the pear tort, all desserts are €3, smothered in warm chocolate sauce on our second visit and were not disappointed. The tort was warm and fresh, fresher than the bread unfortunately, and the chocolate sauce equally so, tasty and not overwhelming. The service on our first visit was excellent and friendly, even though the place was packed (the place seats only around 50 diners at a time) and when the bill (conto) arrived, the extra 1/4 litre of wine we ordered and the service charge (servizio or coperto) were missing, so we left a generous tip. On our second visit, we arrived very early (by Italian standards), around 7:00 PM, and the trattoria was basically empty. The tattoo covered waiter seemed a bit overwhelmed by our arrival and spent more time surfing the internet than taking care of customers. We had to ask the chef for wine and my wife had to get up to get the dessert menu becaise our waiter had mysteriously disappeared. The chef seemed embarrassed by all of this, as he should be, but it really did not detract from our wonderful meal. The only other disappointment remains to be the bread, while tasty, is obviously leftover from lunch, possibly yesterday's. 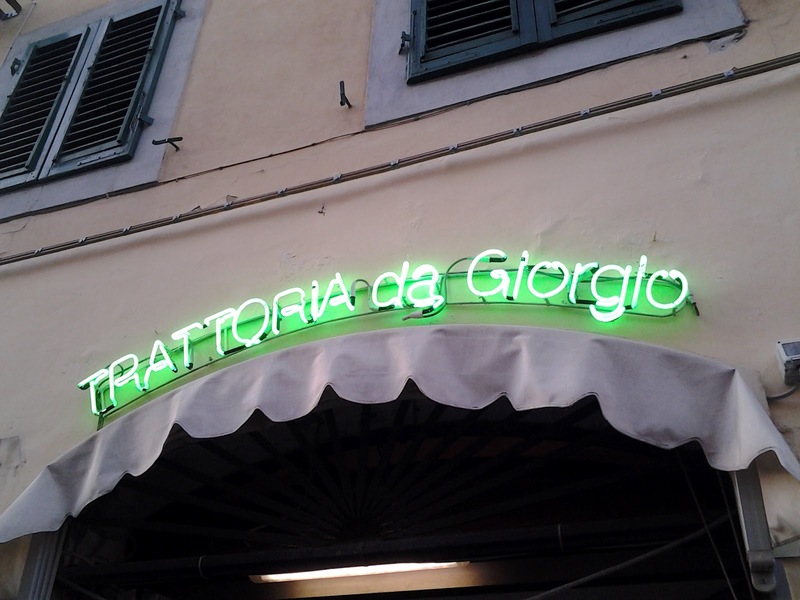 In any event, we will be returning again over the next month and will add menu items as we go...buon appetito da Giorgio! 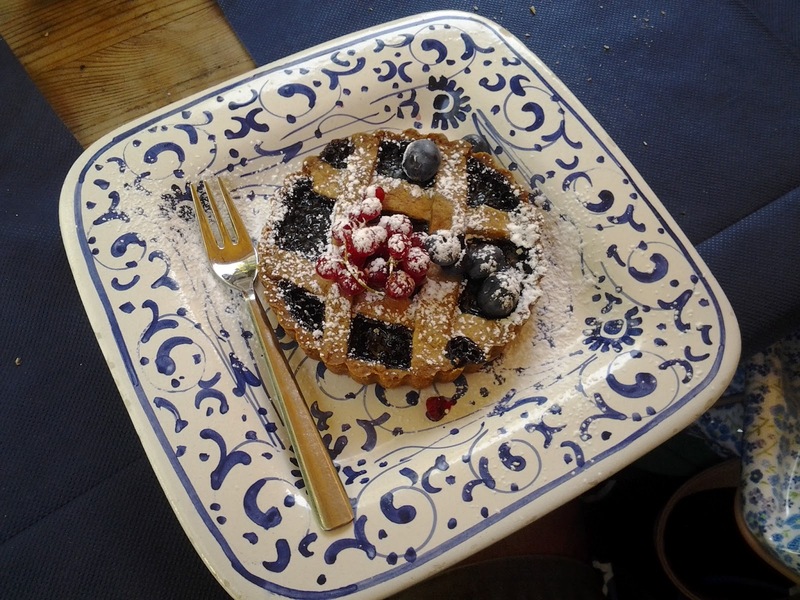 Abondanza...Simpatico...Buonissimo...La Vinaina is a Bargain and Treat in Residential Florence! My wife and I visited La Vinaina on several occasions with the students of the University of Kansas in July 2012. Our apartment was just around the corner and we enjoyed the proximity, warm welcome, fresh ingredients, and very reasonable prices for lunch. Being a chef and food restaurant critic, having traveled to 46 countries around the world, I have eaten at few restaurants with the impeccable quality and value as we found at La Vinaina. The pasta and bread...always fresh; the meat and fish...always prepared to perfection; the service...always attentive and friendly. I would recommend this restaurant to anybody...on a budget, like students, to more EXCLUSIVE and seasoned travelers alike. There is something for everyone at La Vinaina! 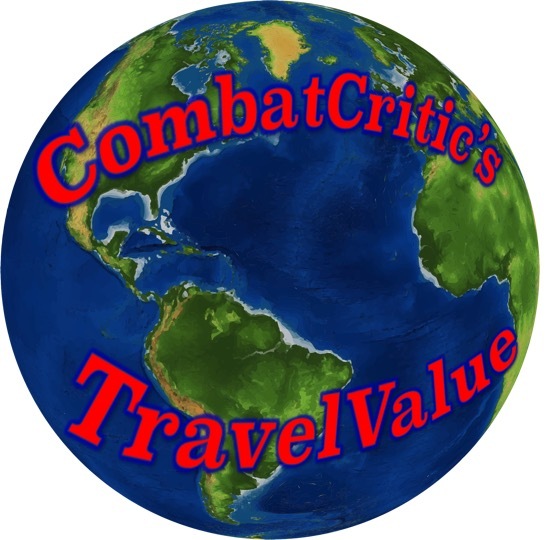 Watch My Video of La Vinaina and Surrounding Area on CombatCritic TV! 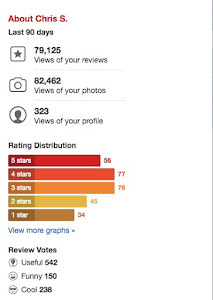 I have also posted reviews on Yelp, Trip Advisor, and Fousquare...search for "CombatCritic" and send a Friend request. CombatCritic gives La Vinaina 7 BOMBS OUT OF 10...bombs in this case are good! LIKE La Vinaina on Facebook! Bring your fan...it's hot, and I am not talking about the food. Beside the lack of AC, the pizza was good, although a bit overpriced and the house wine (della casa) not inexpensive (7 Euros/Half litre), but as hot as the room. We had a pizza with prosciutto, walnuts, and gorgonzola cheese (7 Euros) and another with salame piccante (similar to American pepperoni, but much better), mozzarella, and tomato sauce. The salame pizza was very good, reminding me of pizza napolitana (Naples style) and the pizza prosciutto was dry and crisp, not all that great. The owner told us he is Egyptian and the staff were mostly Eastern European. Considering the heat, and the great amount of sweat emanating from the owner, the service was good, not great. 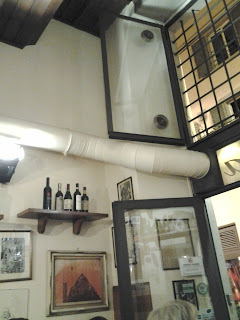 Thankfully, the owner did not bend over our table and our pizza was served senza (without) sweat! 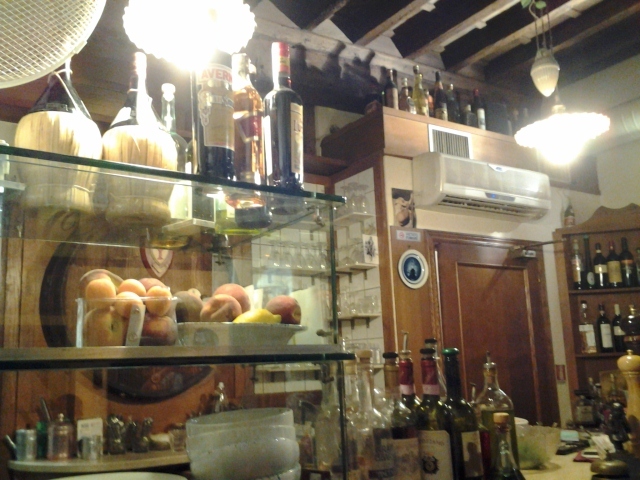 Osteria Santo Spirito is a small osteria with outdoor (covered) patio on the Piazza Santo Spirito, varied menu, and fairly reasonable prices. The Spezzatino Di Manzo (beef stew) was HUGE and delicious (€15) with big, tender chunks of beef and potatoes in a gravy much like you would find it the US. The gnocchi in salsa di formaggio gorgonzola e tartufo (€10 - cheese and truffle sauce) al forno (baked) was scrumptious and plentiful. The ravioli in cream and walnut sauce looked delicious and was also also huge (€12). The insalata mista (mixed green salad) came in a bowl the size of a cooking pot and was fresh and colorful. The crostata di mirtilli (blackberry tort) was warm and tasty, and the accompanying caffe Italiano completed the meal nicely. The service was fair and the staff spoke English well. In all it was a nice lunch at moderate prices. Smaller portions and prices are also available on some dishes. 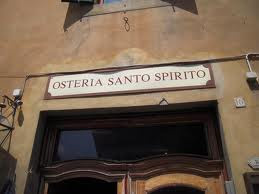 CombatCritic gives Osteria Santo Spirito 6 bombs out of 10. Buon Appetito ... A Presto!